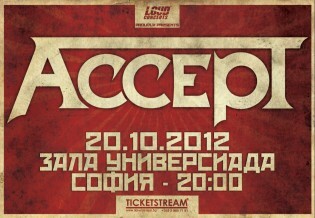 Loud Concerts proudly presents the upcoming show of heavy metal legends ACCEPT in Sofia, Bulgaria. The German metal machine will hit Universiada Hall on October 20th 2012. The show will be part of the upcoming ACCEPT European tour, supporting their latest album “Stalingrad”, 13th in their vast carreer and already a great success. Tickets are on sale on the Ticketstream and Eventim ticketicng networks, all their respective retailers and online on www.ticketstream.bg and www.eventim.bg. The price is 40 BGN on presale and 45 at the door and the day of the show.